Perfect is in the eye of the... doer? 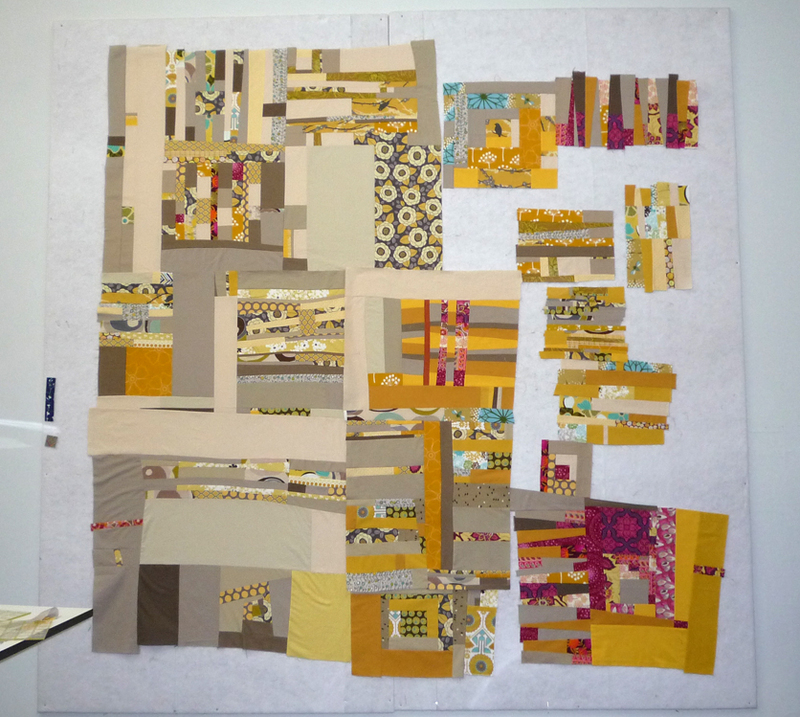 One of my running statements when I participate in a VQB (virtual quilting bee) is that I am far from a perfectionist. I certainly do my best to deliver a well-conceived and well-executed block to my other bee mates, but when it comes to the blocks sent my way, if a corner doesn't match or a seam is off by a smidge... enh, I'll work with it. No worries. Nobody's perfect. 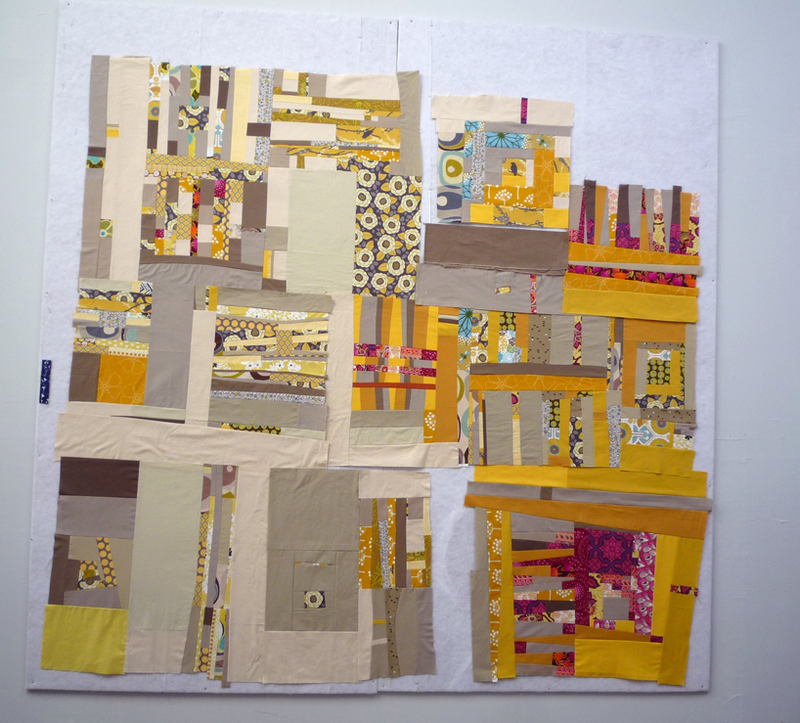 a BOM from a couple of years ago... all pieced by me, block in the upper left has a couple points missing their marks, the one in the lower right is the same, and you might notice the setting block where I had to substitute fabric after miscalculating and not being able to find more. Making due, man! And then it comes to working on layout for a quilt (whether it's a bee quilt or one I've pieced entirely on my own) and I learn something about myself. I'm not a technical perfectionist, but oh my, overall design will getcha every time! And by "getcha" I mean ME. If you've been checking out my blog (or my flickr or my facebook page) lately you have no doubt been seeing my adventure with the Design Camp 2 improv bee blocks which I have been receiving since last August. In fact, two have arrived within the last week or so! So, I put these guys up on the design wall about 5 weeks ago to begin working on piecing the top. At least some of the blocks have remained up there all of that time, going through any number of reconfigurations, new layouts, edits and so on while I fill in the blanks. The first two photos are pretty much just where I left things that day. Many other arrangements occurred in the mean time. I lost count ages ago. And after stepping back and taking in what was going on mid-afternoon yesterday (3/15/13 - the photo above on the right) I realized that this got WAY BUSIER than I had ever intended. And also entirely unbalanced. 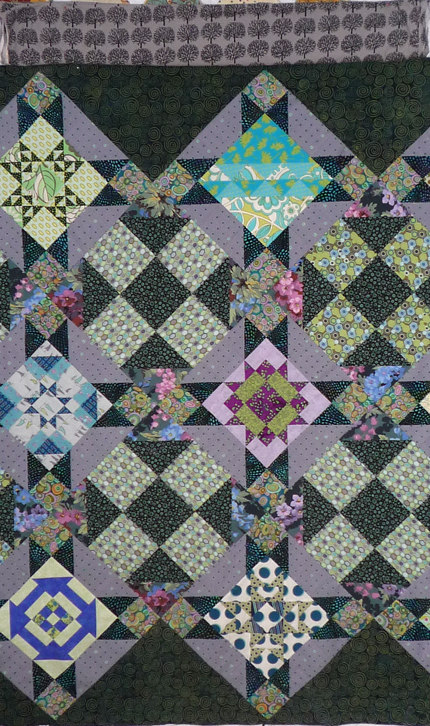 I don't do well with imbalance in my quilts. See, the perfectionist is rearing her ugly head. Next step... taking almost everything off the design wall! Undoing a couple of seams that were already joining large areas of the top and just playing again. And I have to admit, one of the decisions that made this new approach possible is to use several of the pieced blocks on the back. There was just too much crowding of the lower right quadrant and I still hadn't brought in the last block to arrive. I hope no one from the bee feels shirked, as I love all of the blocks I have, and am still being very considered in which ones go together on the other side of this quilt-to-be. The changes are definitely subtle, but hopefully still make a difference. (oh, and please excuse the angle of that last photo... tripod and wall not quite on the same plane - oops). I may have said this already in a previous post, because I KNOW I've thought it several times while working on this guy, but here it is again: Improv quilts are really tough to put together!! There's something to be said for having a plan going into the process, even if one allows oneself to adapt the plan mid-stream. I think I will be glad to get back to something easily drafted on my graph paper where the parts fit together in a regular way and I just get to play with the variations in color and value again. But I shall see this to the end before I allow my design wall to move on to the next project!! And with that, I am committed!